Strictly speaking, the liver, gallbladder, and pancreas are not organs of digestion. However, chemical digestion in the small intestine relies on these organs to cleanse the body of toxins and produce essential hormones and enzymes that aid in digestion. This module considers these organs, emphasizing their role in digestion. This module presents an overview of the various categories of digestive system disorders with a description of the organ affected. This module focuses on peptic ulcers, which are technically associated with acid and pepsin. They require the acid environment that exists in the stomach (gastric ulcer) and duodenum. The module distinguishes these from stress ulcers, and explores further the cause, symptoms, diagnosis, and treatment of peptic ulcers. This module looks at the etiology, symptoms, diagnosis, and treatment of GERD. This module discusses two chronic inflammatory diseases of the bowel—Crohn’s disease and ulcerative colitis. They are commonly referred to as inflammatory bowel disease (IBD). Irritable bowel syndrome (IBS) can involve the small intestine and/or the colon; it is also known as a spastic or irritable bowel. IBS is a functional disorder (also identified as a motility disorder), and one of the most commonly diagnosed GI disorders in Western societies. If not treated and managed promptly and sensitively, the disease causes a great deal of emotional stress and can destroy a patient's self-image and confidence. This module discusses its etiology, symptoms, diagnosis, and treatment. The digestive system is a veritable science lab in which dynamic mechanical operations and staggeringly complex chemical reactions initiate a chain of events that fuel the body. 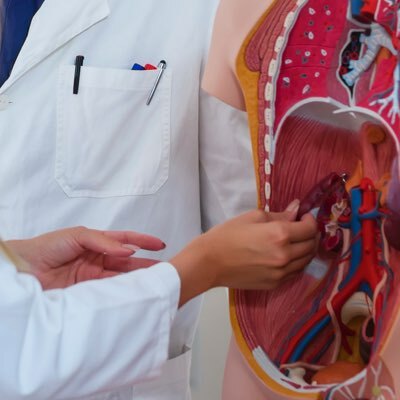 This module introduces you to the functions of the digestive system, the organs that connect to form the gastrointestinal (GI) tract, and the tissues that comprise the GI tract. It also acquaints you with the structure that helps keep the organs in place—the peritoneum. This module discusses the components involved in the initial steps of digestion. These include structures within the mouth (oral cavity) and two organs (the pharynx and esophagus), which move food from the mouth to the stomach and intestines. The process of digestion includes all the changes food undergoes in the alimentary canal, enabling the absorption of nutrients. Some of the changes are mechanical, and others are chemical. This module discusses these digestive processes and the mechanisms by which various substances are absorbed. The processes of digestion and absorption occur mostly in the stomach and small and large intestines. This module explores these organs and their functions. It also addresses the significance of the appendix.